If you're the type of person to always put things off until the last minute, you're not alone. When people give you grief about your apparent laziness or inaction, you might feel guilt and shame. But what if procrastination isn't such a bad thing after all? As it turns out, it may be a common trait in highly successful people. Psychologist Mary Lamia is an expert in procrastination. She'll explain how our emotions motivate us when we're faced with tasks and deadlines, and how people with different motivational styles can manage relationships at work and at home. Psychologist, psychoanalyst, professor, and author Mary Lamia, Ph.D.
What Motivates Getting Things Done: Procrastination, Emotions, and Success by Mary Lamia, Ph.D.
On Relate: "Bend your brain and enter the experience-time continuum"
TAMARA STANNERS:	The famous French author, Victor Hugo, was well known for putting things off until the very last minute. For instance, he started writing The Hunchback of Notre Dame in the fall of 1830. Now the deadline for this was February 1831. That is a very short amount of time. He didn't feel like writing at all, though. Hugo wanted to be out in the world, exploring instead, and coming up with the stories. Living his life. So he kept putting it off, and putting it off, and putting it off, until things got a little desperate. So he decided to do something that would force him to stay in and write, no matter what he wanted to do. He got someone to take all of his clothes. Every last stitch, and lock them away so he had no access to them. And all he had was a shawl to wear, for weeks, so that he couldn't go out. He had to sit down and concentrate, and write. And it worked. He finished the book weeks before the actual deadline, but it was a really extreme approach to overcoming his procrastination. If you're a procrastinator, and getting naked isn't the most practical solution for you, stick around. 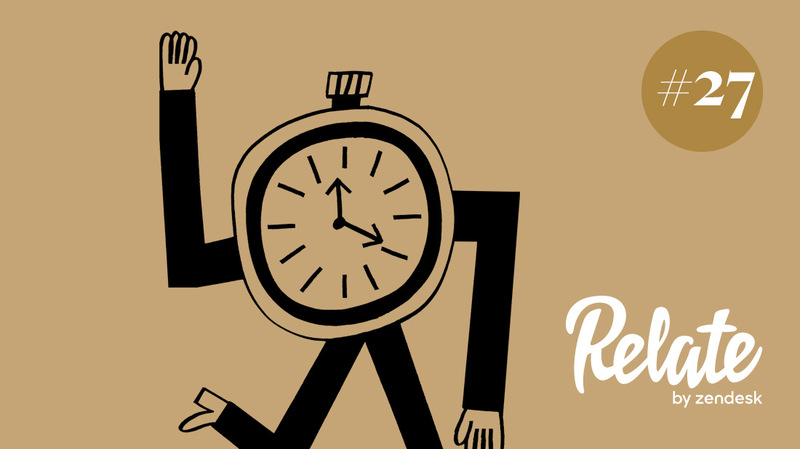 You'll find out why procrastinators put things off, and why it's not necessarily a bad thing. And that's what's happening on Relate. I'm Tamara Stanners, and this is Relate by Zen Desk. Producer Andy Sheppard is here to talk about our relationships to deadlines. I'm glad you made it on time. ANDY SHEPPARD:	Well, what are you saying? I'm not sure I ... do we really have to do this right now? TAMARA STANNERS:	Yeah. Tick tock, tick tock. ANDY SHEPPARD:	All right. Well you know what they say, never put off until tomorrow, what you can put off until the day after tomorrow. TAMARA STANNERS:	Exactly my motto. ANDY SHEPPARD:	But we might as well get into this episode. TAMARA STANNERS:	Okay. So seeing as how we're here. MARY LAMIA:	I'm Mary Lamia. I'm a clinical psychologist. ANDY SHEPPARD:	Mary is all about emotions. MARY LAMIA:	I'm passionate about the study of emotions actually. Emotions are basically a motivational system. They motivate every single thing we do. And they also motivate when we get things done. MARY LAMIA:	Those people I call task-driven. People who's emotions were activated when they had a task to complete, or whenever they would see a task to complete. TAMARA STANNERS:	So these task-driven folks, they're the people who like getting stuff done as soon as possible, right now? MARY LAMIA:	These people sort of complain that when they would walk into the house they would see bread crumbs on the counter, or mail that hadn't been answered, and unlike their partner, they had to get it done right away. And they wondered why their partner didn't do it. And they would become agitated and anxious about things that needed to be done. And then there were people who were motivated, seemed to be motivated, and activated emotionally by deadlines. That they knew they had a task to complete, but they didn't start to do it until the deadline was looming. Those people, I call deadline-driven. The others I call task-driven. And the deadline-driven people are the procrastinators. TAMARA STANNERS:	Ah, the dreaded procrastinators. ANDY SHEPPARD:	So here's the thing that's unusual about Mary Lamia's work. We have these sort of negative ideas about procrastinators, but she sees nothing wrong with procrastination. In fact, those highly successful patients that she works with, many of them are procrastinators. She sees people who procrastinate as getting a bad rap from society in general, or the research community. TAMARA STANNERS:	I like her. ANDY SHEPPARD:	Yeah. Well the way she sees it, procrastinators ultimately get things done. They're just motivated by different things. In this case, deadlines. MARY LAMIA:	We've stigmatized them so much they often feel as though they have some kind of pathology, when they don't. It's interesting, because people who are deadline-driven procrastinators aren't activated by tasks when they see something that has to get done until it's close to a deadline. Their emotions are just not activated. Often, they beat themselves up about not having the motivation to do something, or they feel lazy. They are constantly shamed and degraded, and this happens from the time they are very young. ANDY SHEPPARD:	Mary wants us to take a fresh look at these two camps of people. The task-driven people, and the procrastinators, but also not to confuse procrastination with failing. TAMARA STANNERS:	Okay. I like this. ANDY SHEPPARD:	Yeah. So first off, the task-driven folks, the people who see a job that needs to get done, and they just barrel ahead and get going, they're not always the well-adjusted people that they might seem to be. MARY LAMIA:	We always think that early birds are better than those who delay. And that is absolutely not true. And we also think that procrastinators, because of all the stress they have at a deadline, are more stressed out than people who are task-driven. But task-driven people are constantly anxious about a task to complete. They see things that have to get done, in their mind, these things have to get done, and they have to get done now. So they're constantly anxious or stressed, even if they're not aware of their anxiety level, they're activated, emotionally, far more than deadline driven people are. TAMARA STANNERS:	That's kind of counter-intuitive. 'Cause I'm used to this idea that the procrastinators are the ones who are stressed, and causing the problems. ANDY SHEPPARD:	Definitely. But Mary Lamia has put that perception under the microscope, and she's helped reveal the benefits that procrastinators can bring to teams. MARY LAMIA:	It's somewhat of a shame that employers don't know the benefits of either motivational style, and hire people according to those styles, because there are advantages to each. Procrastinators are very, very good at doing something, putting everything together at a deadline. So if you have, let's say, four task-driven people, and two procrastinators on a team, the four task driven people might do all of the research ahead of time. The procrastinators would be great at putting it all together. TAMARA STANNERS:	How did this get so far off the rails, in terms of our perception of procrastination being such a bad thing? ANDY SHEPPARD:	Well, the assumption has always been that people who procrastinate very often fail. And that's simply not what Mary has found. MARY LAMIA:	Many high achievers I study were deadline-driven procrastinators. In fact, they were the greatest achievers. People who fail are very different from people who are deadline-driven procrastinators. ANDY SHEPPARD:	And here's one of the main reasons why we tend to equate procrastination with failure. MARY LAMIA:	The data is so overwhelmingly negative toward deadline-driven procrastinators, and there's a reason for that. I've never seen ... well I've seen one, out of over 1,000 procrastination studies, I've only seen one that separates those who fail from those who succeed. And so deadline-driven procrastinators are lumped into the same pool of shame with people who fail. And one really must separate out those two groups of people. TAMARA STANNERS:	That's really alarming, you know? ANDY SHEPPARD:	It really is. I mean, that procrastination has basically been assigned this stigma of failure, simply because lots of studies presumed that procrastinators would show a lack of success. MARY LAMIA:	People who fail are very different from people who are procrastinators. Often, people who fail have experienced a lot of shame in their lives. So what happens is that when a task has to be completed, their emotional memories are of failure. We have a warehouse of emotional memories, and those memories determine when emotion is activated in the present, based on any stimulus, like a task to complete. So when they don't get something done, they often say, "Well, I failed to get it done because I'm a procrastinator." Shame motivates us to save face. And what better way to save face than to claim that you are a procrastinator, rather than there's some other emotional issue that's handicapping you. And that's why procrastination is absolutely not an excuse for failure. TAMARA STANNERS:	Have there been studies that separate them out? ANDY SHEPPARD:	Well, Mary describes one study with some pretty interesting results. MARY LAMIA:	One study took a look at whether or not procrastinators and non-procrastinators would put down somebody who failed to meet a deadline. And the hypothesis was that procrastinators would let them off the hook, whereas non-procrastinators would reprimand people who fail to meet a deadline. And what they found was the opposite. Procrastinators were actually more critical of people who missed a deadline than the non-procrastinators. And they could understand why that was. Well procrastinators don't miss deadlines. And of course they would be critical of people who miss them. So they don't take a look at, well how about these people who are succeeding, versus these people who are failing? There's a huge, huge difference. TAMARA STANNERS:	So here's the big question. Is one style better than the other? MARY LAMIA:	No, no, no. Neither. It's just a motivational style. It's just when your emotions are activated, to get something done. And we don't have a whole lot of control over that. Now cognitively, you can alter that. The person who has to do the dishes ahead of time can learn to put that aside a bit. And learn not to be anxious that the dishes aren't done right away. And the procrastinating partner can learn how to do the dishes, because they want to please their partner. I mean there are other emotional motivators there. Wanting to please a partner, or your boss, or somebody else, there's a lot of variations on the theme, but there are these two basic differences. ANDY SHEPPARD:	In the end, it's all about understanding our motivations. And for Mary Lamia, those motivations always come from emotions. MARY LAMIA:	In order to have positive relationships, one needs to understand emotions. That would help tremendously. We would relate so much better to one another if we understood how emotions motivate us, and how we differ in terms of that motivation. TAMARA STANNERS:	Mary Lamia is a professor at the Wright Institute in Berkeley, California. She's also a clinical psychologist, and the author of What Motivates Getting Things Done: Procrastination, Emotions, and Success. I've put a link to the book in the show notes. Special thanks to Tina Pittaway for that interview, and for helping to put the episode together. And of course, thanks Andy. TAMARA STANNERS:	Hey, have you got your Christmas shopping done yet? ANDY SHEPPARD:	Have I got it started yet? No. It's the middle of December. I got time. TAMARA STANNERS:	Of course you do. ANDY SHEPPARD:	Stores are open on the 24th, right? That's it for this season of Relate. We've got big plans for season two though, so watch this space. If you haven't already, subscribe to Relate for free on Apple Podcasts, or wherever you listen, and the next season will come your way, automatically. If you're new to this podcast, we have 26 more episodes available, along with a ton of great articles on how to connect with your customers in deeper ways. Find it all at Relate.Zendesk.com. And for a free trial of our customer service software, check out Zendesk.com. I'm Tamara Stanners, talk to you again soon. ANDY SHEPPARD:	Awesome, nicely done!